Obvious really - bugger all exposure time. I set up to take 20 x 30 second exposures at ISO6400. Out of those only 7 were useful for stacking due to trailing caused by wind or periodic errors in the worm gear of my mount. While the 7 images will have helped reduce the amount of noise in the image (I also combined in Darks+Bias in the pre-processing), 30 seconds just wasn’t sufficient to bring out this faint nebula when post-processed in Nebulosity 3 and Photoshop. I think something more like 5 minute exposures is required reduced to ISO800, but for that I will need to use autoguiding - something I don’t have the right equipment for just yet (although I’m close). Also my EOS600D has not been modded to remove the infra-red filter, and so I’m only likely to bring out the brighter parts of the nebula anyway. So while this image is a bit pants, well apart from the fact its quite a nice starfield, I try to take something positive from it, and hope that in due course I’ll take a much better one which does The Crescent proud, and will put this one to shame! 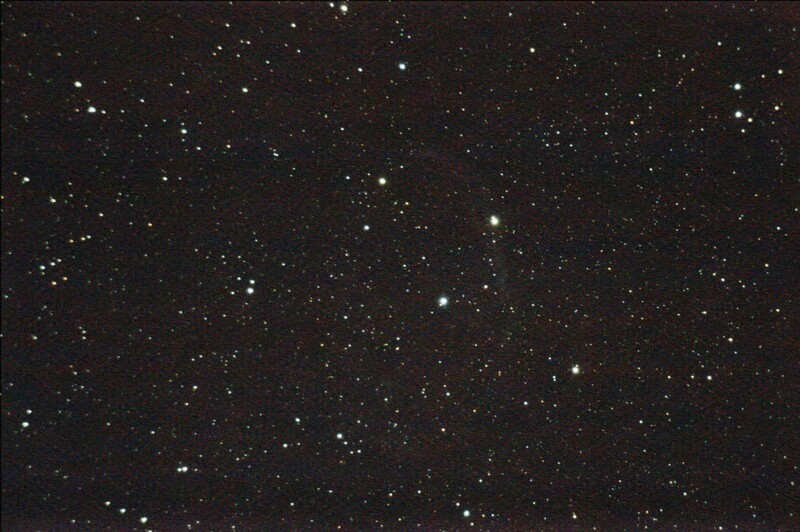 This entry was posted on Friday, October 5th, 2012 at 7:59 pm	and is filed under Astrophotography, C6-SGT, Observing. You can follow any responses to this entry through the RSS 2.0 feed. You can leave a response, or trackback from your own site. Spam protection: Sum of three + nine ?